Really clever website here. 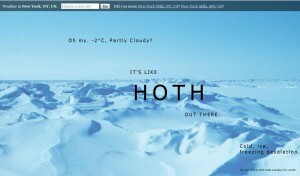 Go to the site, enter your city or zip, and it gives you the weather, in Star Wars terms. New York? Chilly, it is. » Now how great would this look with an iMac on it?